I made this mini for our guild's silent auction, to be held at our upcoming quilt show, February 13 through March 9, 2018, at Dakota County Historical Society Museum, South St. Paul, MN. It was totally inspired by Cassandra's 9-Patch Circles at The Not So Dramatic Life blog. I love Cassandra's idea of extending the circle with matching threads and a lot of stitching. I used various Aurifil and Bottom Line threads to match, and white Presencia in the bobbin. Here you can see why longarmers have a general rule of the same color thread in the top and bobbin: dots! But that was more bobbin winding than I wanted to do. I put tabs in all four corners so the purchaser can hang it any way up. I also slipped in quilting this baby charity quilt for my sister over the weekend. She bought her fabrics at Tuesday Morning. Who knew that was a place to look for fabric?! 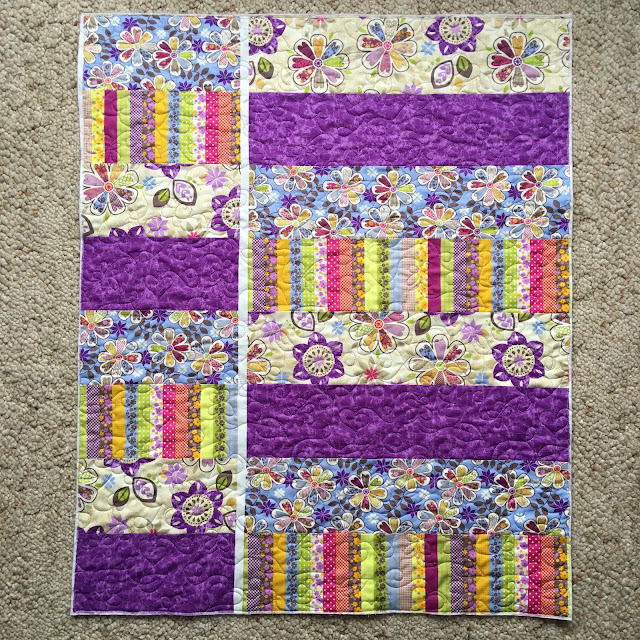 I quilted it with "Butterfly Garden". This is our favorite baby quilt pattern, "Simple Gifts" by Modern Quilt Studio. My sister is also making baby quilts for Jack's Basket. If you got snow yesterday, I hope you're getting shoveled out today. We had about a foot of snow! This is perfect quilting weather! 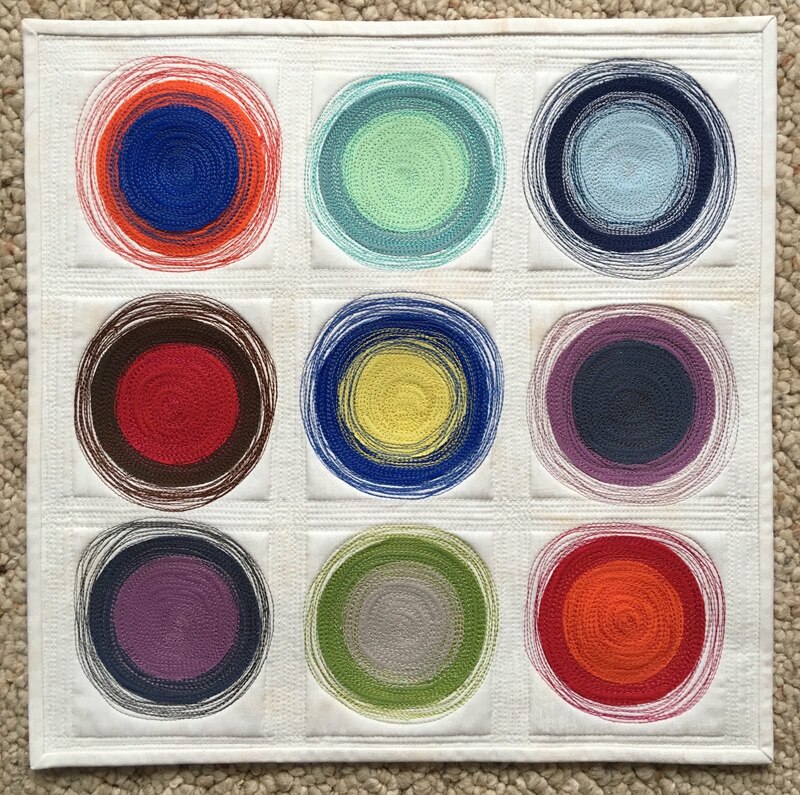 Your circle quilt is very cool! The thread painting is so dynamic and vibrant. Are the circles raw edge appliqued? What a great mini-you did so good on the thread painting. We got about 10" of this thick heavy stuff. I love the thread painting on the mini and the baby quilt is wonderful. I never heard of Tuesday Morning - but we do have 2 near us...always good to know more sources for fabric. No snow on the east coast, thank goodnes, foggy and dreary today and maybe a little ice! 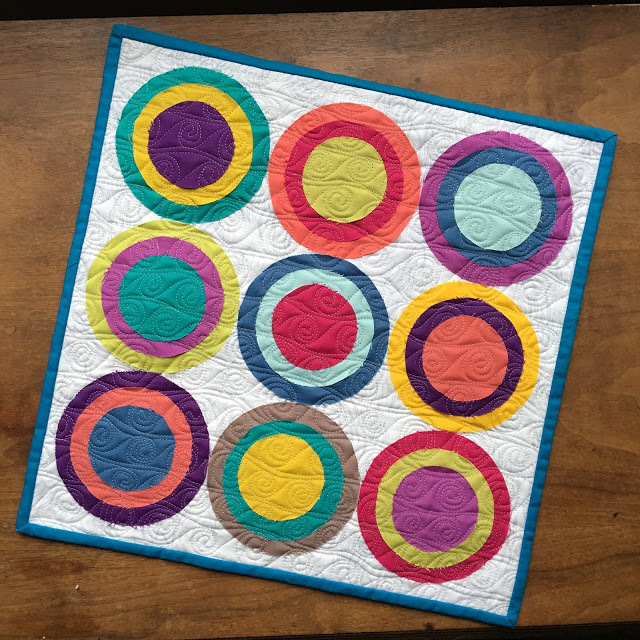 Oh my that circle quilt is REALLY cool! I love how you extended the circle with the thread, and also the 3D effect you introduced by leaving the corners unquilted. It's gorgeous! I so love this quilt!!! 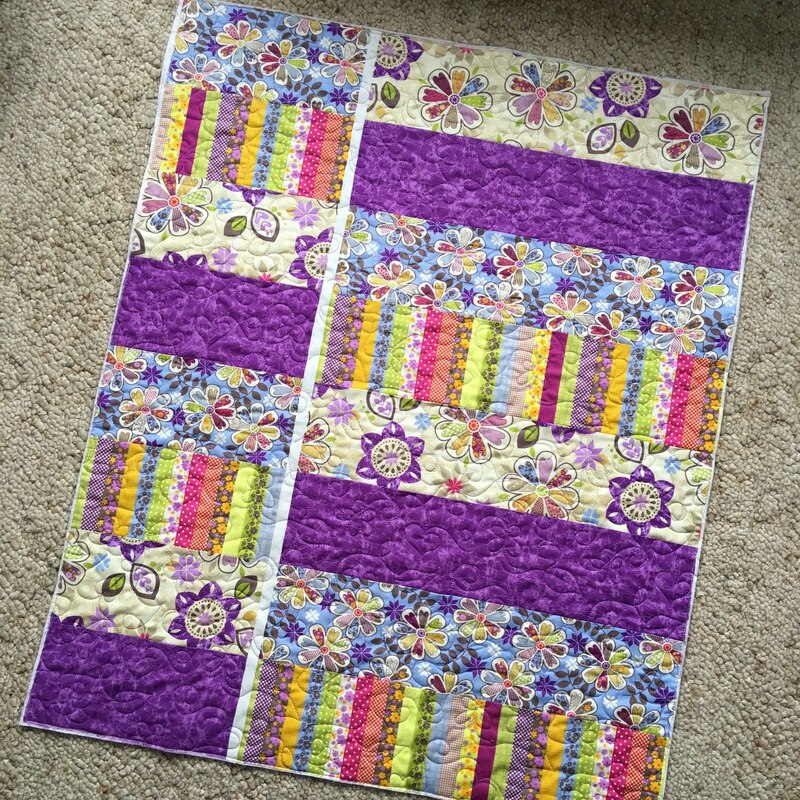 This is a wonderful project for snowy day quilting. Thanks for the inspiration. What a cute quilt! You continue to inspire me, Nancy! I hope to get to the show, so I'm keeping this in mind. We just got home tonight, to about 17" of snow in our driveway. Yikes! The circle mini is inspiring and appealing -- hope it sells for a good price!! I love this! I saw Cassandra's and love it! These circles make me want to play....thanks for sharing! 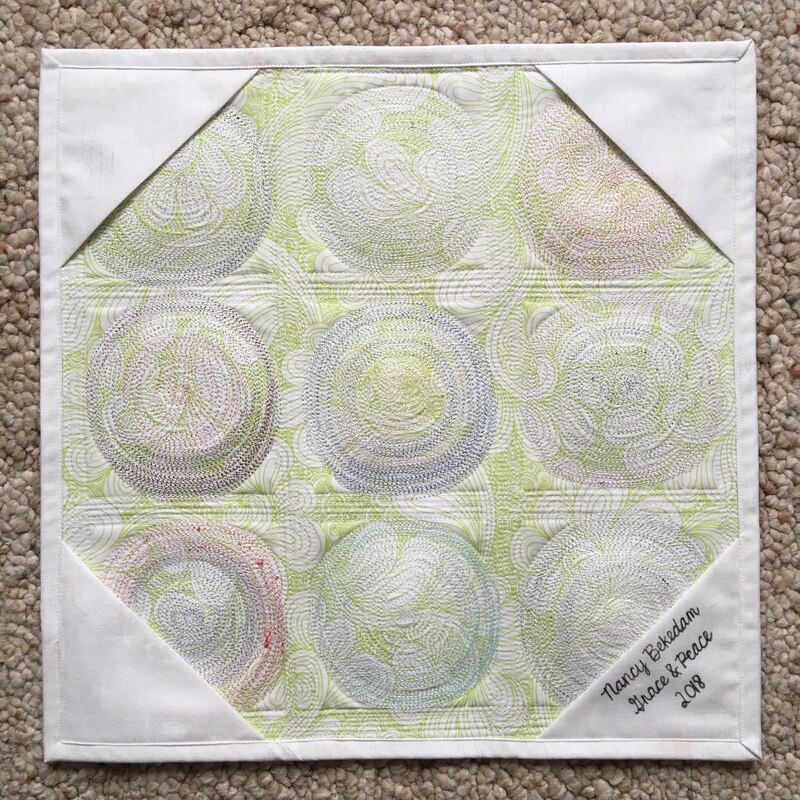 These are lovely, Nancy, especially the little circle quilt, and I love how you did the corner flaps for hanging. Oh wow, your circles are beautiful, the threads work so well, and I love the sleeves on the back giving the new owner the choice, thanks for sharing! Oh!!!! I love dots!!!! Your label is gorgeous! A foot of snow! Yikes! Wow, I really like your Circles quilt! Well both of them, but the one with all the stitching to extend the circles is really great. Fun baby quilt too. Thanks for linking up with TGIFF! 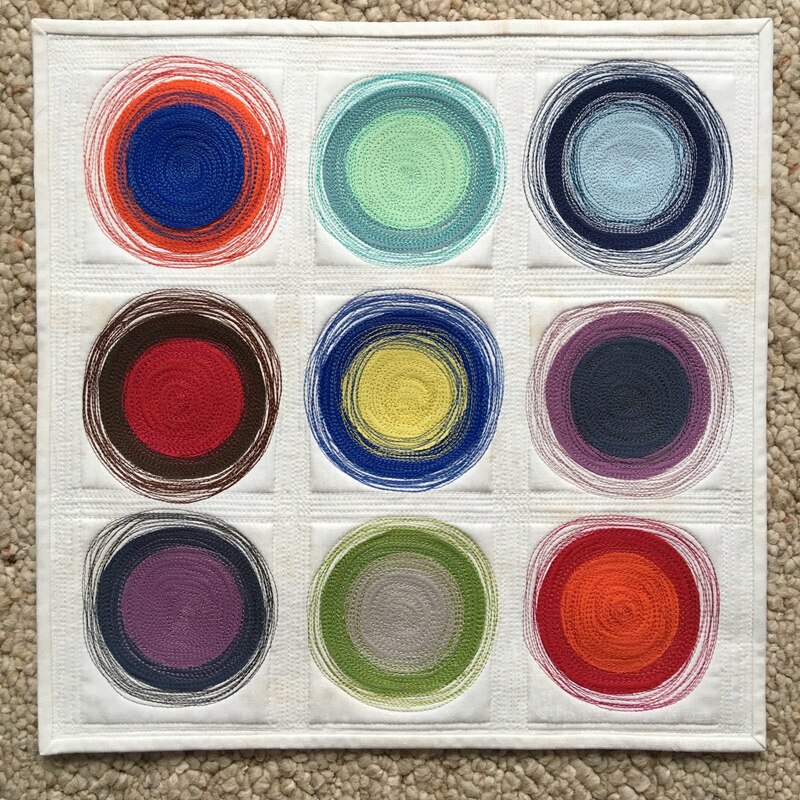 I love the circle quilt and how you extend the circle color with thread. Very cool! 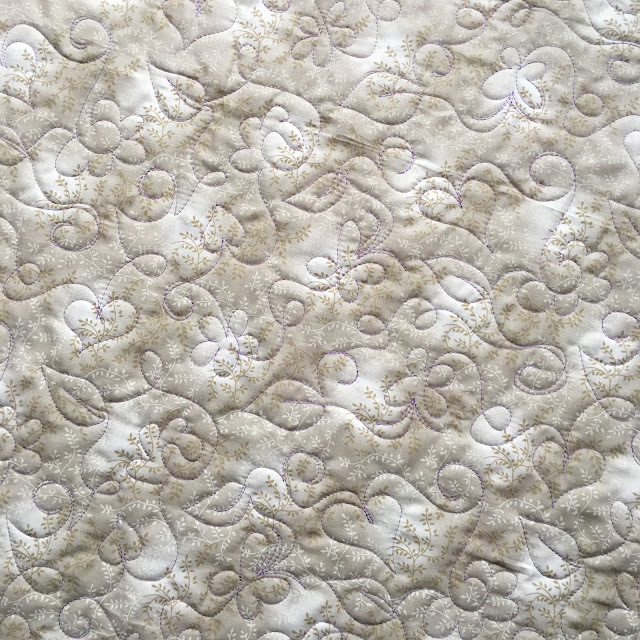 That's a pretty baby quilt, and I absolutely LOVE both your new and old circle quilts! I love the circles! So simple but yet so effective. I love your mini Circles! The Modern Circle quilt is awesome. Your circle quilt is awesome. I love how the threads extends and blends the circle colors together. I fell in love with Cassandra's circle quilt too. I love your mini version. Thanks for sharing with Oh Scrap! Love your modern circle quilt and the thread painting is awesome! Great job! Love, love, love that circle quilt! That is gorgeous.